2. Mix the dry ingredients together: Flour salt, baking soda, and baking powder. 3. Cut cold butter into the flour mix until the mix resembles coarse cornmeal. 4. Add in yogurt, vanilla, zest and egg. Whisk until a dough is formed. 5. Chill the dough for 30 minutes in the refrigerator. 6. Lightly flour work surface, roll out the dough to 1 ½ inches. 1) Preheat the oven to 375°F. Butter and flour a baking sheet, or line it with parchment. 2) Whisk together the flour, salt, and baking powder. Work in the butter to make a crumbly mixture. 3) Mix in cheese and scallions. 4) Mix together the eggs and ricotta. Add to the dry ingredients, stirring until everything is evenly moist. The dough will be very sticky. 5) Flour working surface and your hands. Pat the dough into a 10" x 2" rectangle. For larger, flatter scones, pat into a 15" x 3" rectangle. 6) Cut the rectangle into 5 squares; then cut each square in half diagonally, to make 10 triangular scones. 7) Place the scones on baking sheet, leaving at least 1" between them. 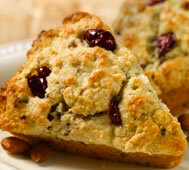 8) Bake the scones for 20 to 25 minutes until golden brown.